Seriously, it isn’t quite football season and game day without some Buffalo Wings, but for me those are off the menu. 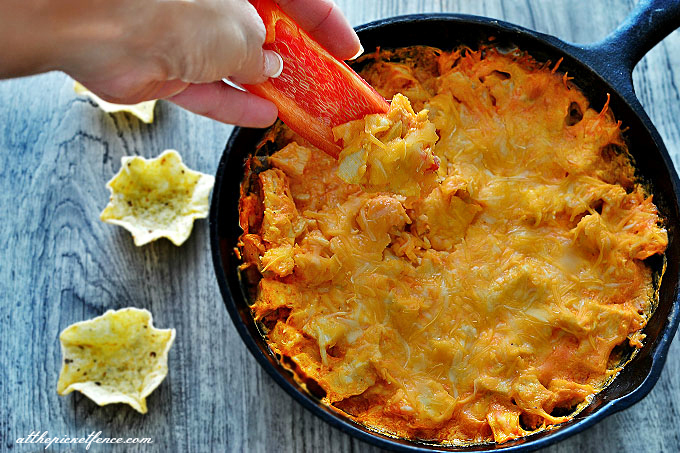 Instead, I love to make this Skinny Buffalo Chicken Ranch Dip! It’s become a family favorite and a perfect “skinner” option for your friends and family that are watching their waistline. Serve it with large wedges of bell pepper, cucumber and, of course, celery for an even healthier way to scoop it into your mouth! If you're trying to watch your waistline than this dip is perfect! 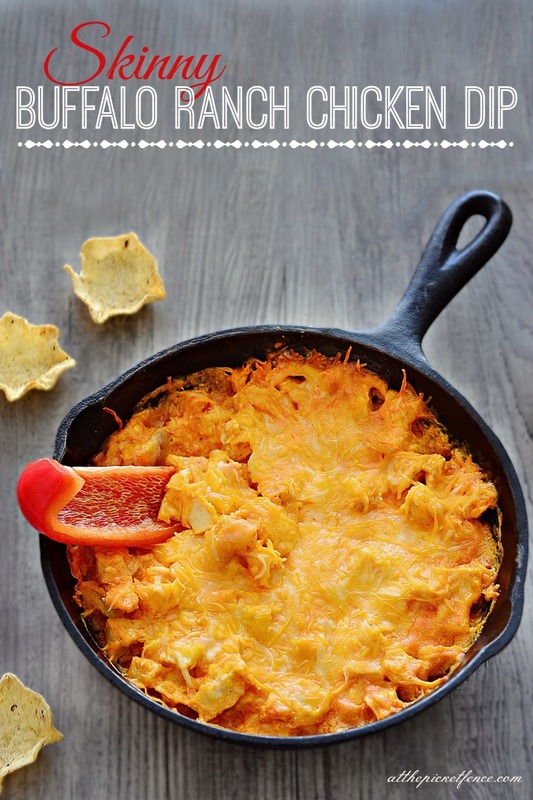 Big on taste, but low in calories, this skinny buffalo chicken dip is sure to be a game day pleaser this fall! Preheat oven to 350 degrees. Bake chicken breasts for 30-35 minutes or until cooked. Remove chicken breasts from pan and chop or shred the chicken into small pieces. Place chicken in baking dish. In a microwavable bowl, combine Frank's Hot Wings Sauce, ranch dressing and cream cheese. Heat for approximately 2 minutes, stirring until cream cheese is completely melted. Once melted, pour the sauce mixture over chicken. Add in half of shredded cheddar cheese and mix together. Replace remaining shredded cheddar cheese on top. Bake for an additional 20 minutes or until the cheese is melted. Serve with veggies for a complete meal! Are you looking for some more great autumn inspiration? Be sure to visit these 12 talented bloggers for some fabulous fall decor ideas, crafts and recipes! 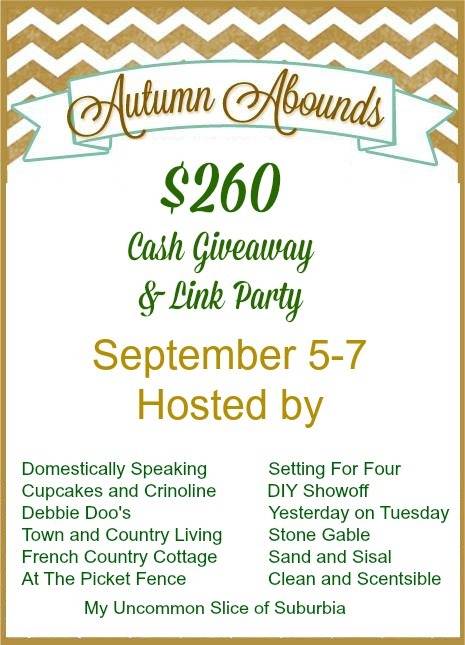 and stay tuned tomorrow for a FABULOUS FALL cash giveaway and linky party! see you back here then…at the picket fence! 30 Comments on "Skinny Buffalo Chicken Dip"
Heather, I have only recently started following your blog. Congratulations on the weight loss. May I asked if you followed a program or was it diet and exercise? I’ve just started (again) trying to lose weight (85 lbs). Thank you for the encouragement. Wow! This makes me hungry…thanks for posting! Heather, you certainly are beautiful from the inside out!!! I admire you so so much (and Vanessa too). Every time I am on your blog I get that “awe, I just love these girls” feeling! This is completely drool worthy – I LOVE anything Buffalo chicken. Pinned! First and foremost congratulations on your weight loss. Girl you look AMAZING! I can’t imagine how you even feel both inside and outside. The dip looks delish! I’m sold! I’m going to make this for the game this weekend! Oh heck… I just might even make it today! YUM! Heavens, girl this looks so amazing! My family will love this! Pinned and sharing via FB. Happy Fall! I’m fairly new to you blog…. can you tell me about your weight loss?? you look fabulous! This looks seriously amazing and I love that it is healthier the other dips. You look so wonderful Heather!!! If I weren’t a vegetarian I’m sure I would love this. 🙂 I can always make it for hubby though! This would be good (and pretty) stuffed in mini peppers! Great recipe! I ove these skillet dips, they are so tasty, and quick to make. Great comfort food. Saving this for game Sunday’s. I think my oldest would love this recipe! Pinning! Yum! My family would LOVE this dip! Definitely going to try it.